These two closely related species form the Arachnids main short-ranged supporting fire, moving alongside Warrior Bug swarms to smash enemies in waves of either flame or acid. Though usually less numerous than Warriors, Blisters and Blasters can be extremely dangerous when appearing en masse. The Blister Bug spews acid at its enemies and though it is fairly short ranged, even Marauder armor can evaporate under its attacks. 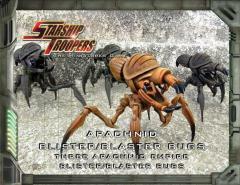 Blaster Bugs breathe fire which is a little less potent than acid but extends much further and is capable of rooting out MI Troopers hiding in the thickets cover. Each box set contains enough parts to build three Blister or three Blaster Bugs. Models come unpainted with some assembly required.